I learned how to make this from my mother in law. Basically, no measurements, just add everything to the pot. It's almost fool proof. Shabu-shabu is a great family meal on cold winter nights. 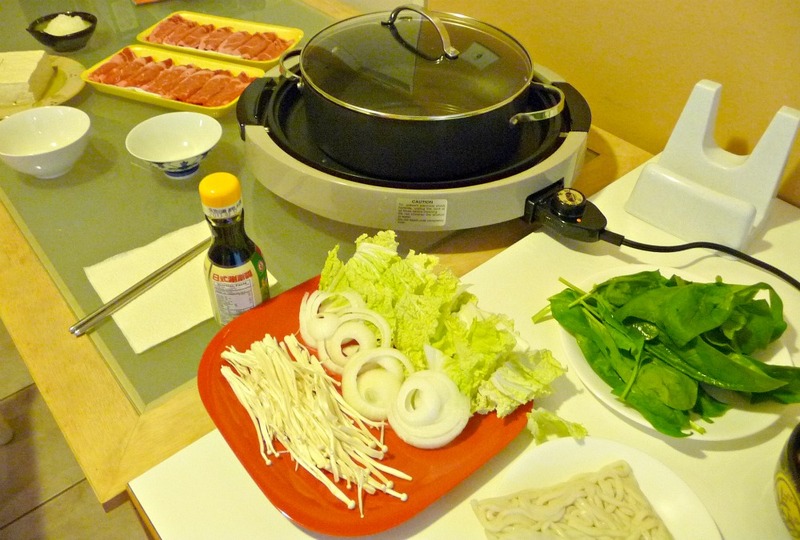 Everything is cooked in a steaming hot pot right at the table. If you don't have a cooker that you can put at the center of your table, there's no reason why you can't still enjoy this wonderful dish. You can just cook everything stove top and transfer it to a slow cooker set on high setting. The only thing you will miss is actually cooking your own food at the table. 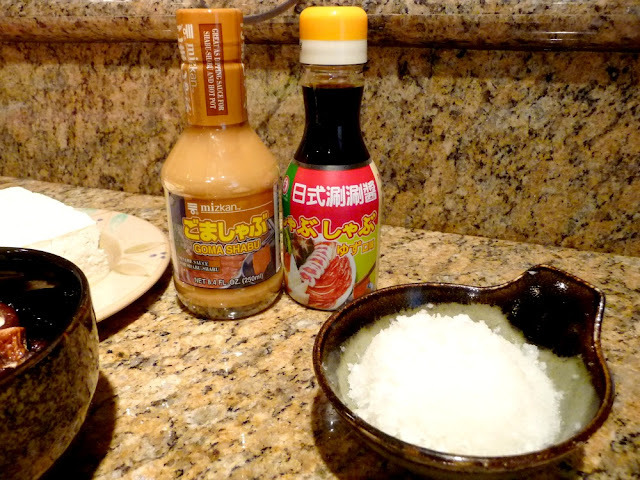 Ponzu sauce is a combination of soy and citrus blend sauce. It is a thin sauce that's really delicious. 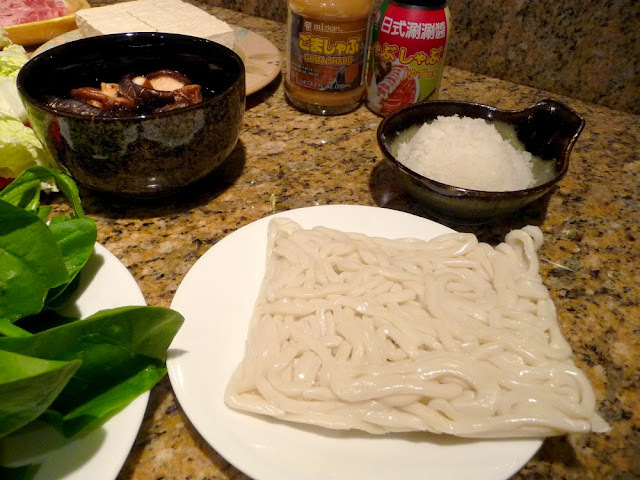 The grated daikon can be incorporated into the ponzu sauce for a more refreshing flavor. The sesame dipping sauce is a thick sauce, which is also very good. Heat up the water in the pot until it simmers. Start adding the ingredients a little at a time starting with the ones that take the longest to cook. You can start with the onion, napa cabbage, udon, mushrooms, tofu, and spinach. Lastly, add the beef. Remember to wash all the vegetables thoroughly before cooking. Enjoy! 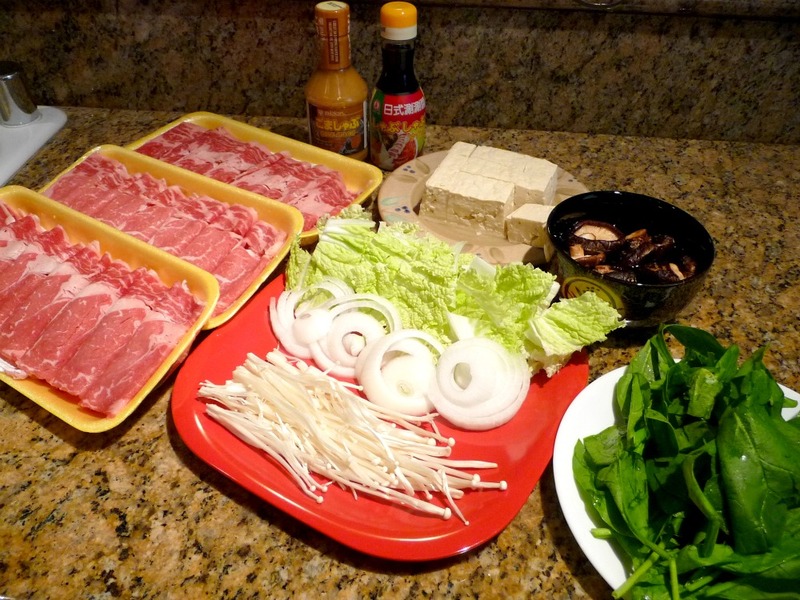 The ingredients: (Left) thinly sliced beef rib eye, (center from bottom) enoki mushrooms, onions, napa cabbage, firm tofu, shiitake mushrooms, (right) spinach. The dipping sauces: On the left is Sesame (goma shabu), on the right is Ponzu. Also pictures is grated daikon which you can add to the ponzu sauce. 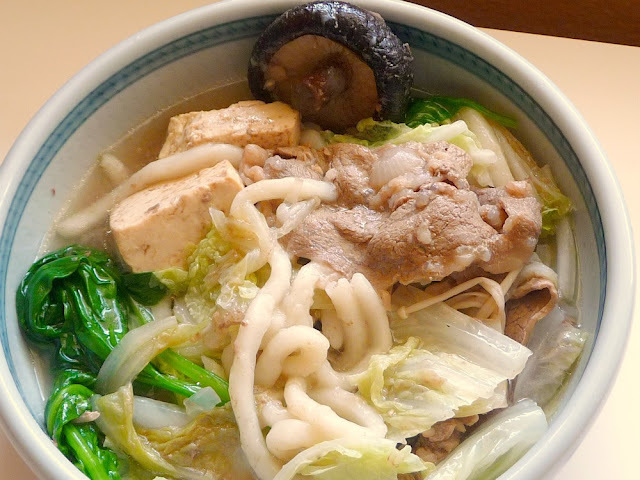 "Udon" - Japanese rice noodles. Set all the ingredients at the table. Wait for the water simmer and start cooking. 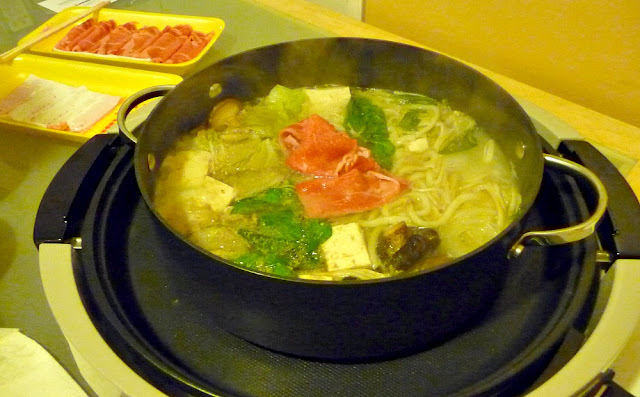 Steamy shabu-shabu staright from the pot.